Sanja Maturi (三社祭) is one of the most famous Mikoshi Festival in Japan. 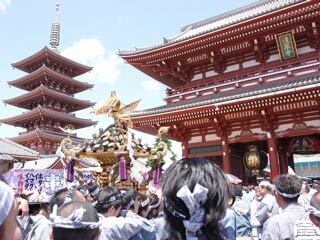 Sanja Matsuri is held in 3rd weekend of May at Asakusa Shrine and Sensoji Temple. It is three days festival and at the last day, all the towns of Asakusa carry the Miya Mikoshi, the mikoshi of the shrine by relay from one town to other town. There are many food stands open at Sensoji Temple. Street will be packed by many people.